CROSSDOWN is a professional crossword puzzle development application. Use it to construct real crosswords just like the kind that appear in newspapers and magazines. With Crossdown’s many features, routine tasks and errors are eliminated, leaving you to concentrate on creating entertaining and original puzzles. Crossdown is not a simple “word-web” compiler or “criss-cross” generator. It is a comprehensive crossword puzzle development application for professionals or serious amateurs. 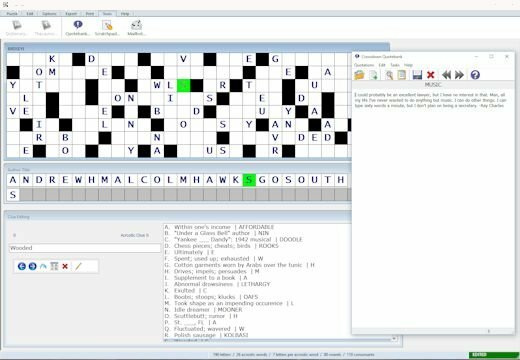 With Crossdown you can print crosswords in a variety of styles, and export puzzles in several popular graphic file formats for use with all word processors and desktop publishing software. You can deploy fully interactive crosswords to websites. You can output puzzles as Adobe PDF files for distribution among other computer platforms, including Macintosh systems. You can also generate standalone puzzle “player” game applications which can be run and solved on other Windows-based computers. Crossdown also incorporates a basic solve mode so puzzle authors can test out their own creations, or just have a little fun! Crossdown is developed by a crossword puzzle professional for other crossword puzzle professionals or serious amateurs. Crossdown runs on all currently supported versions of Windows, including Windows 10. This latest version of Crossdown includes Crossdown Librarian and Crossdown Cluebank. 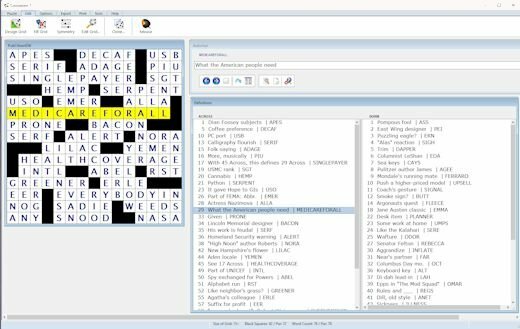 Librarian is a crossword puzzle database manager with which you can group any number of crosswords into collections for quick browsing, comparison, searching, duplicating and dozens of other uses. Crossdown Cluebank is a database for storing crossword puzzle clues. It is fully integrated with Crossdown, enabling you to bring up a list of clues to choose from for each grid entry, or “automatically” clue the entire puzzle with one click of the mouse. ENIGMACROSS is a professional acrostics puzzle development application. Use it to construct real acrostics just like the kind that appear in newspapers and magazines. With Enigmacross’ many features, routine tasks and errors are eliminated, leaving you free to concentrate on creating entertaining and original acrostic puzzles. With Enigmacross you can print acrostics in a variety of styles, and export puzzles in several popular graphic file formats for use with all word processors and desktop publishing software. You can deploy fully interactive acrostics to websites. You can also generate standalone puzzle “player” game applications which can be run and solved on other Windows-based computers. Enigmacross automatically builds the optimum grid based on the quotation that you input. The package also includes the Game Edition so puzzle authors can test out their own creations, or just have a little fun! Enigmacross runs on all currently supported versions of Windows, including Windows 10. This latest version of Enigmacross includes Crossdown Quotebank. Quotebank is a quotation database manager for storing acrostic puzzle quotations or other kinds of text passages. Quotations are organized by topic. Quotations can be formatted for use by Enigmacross right within Quotebank and can be searched on by topic, text string or author-title line. You can also append notes to the quotations to help keep track of how they were used. QUIPTICS is a full-featured cryptogram generator and game software. Use it to produce real cryptograms just like the kind that appear in newspapers and magazines. With Quiptics’ many features, routine tasks and errors are eliminated, leaving you to concentrate on creating entertaining and original puzzles. Quiptics cryptograms are humorous or notable quotations, excerpts or other writings which have been encoded via simple letter substitutions. With traditional cryptograms, for example, all of the Bs may have been replaced with Ms, and the Fs with Ys. This is done for every letter in the original text. Letters in kind are always replaced with the same letters in kind. Quiptics allows you to generate four other kinds of cryptograms: railfence, Playfair, quagmire, and Vigenere. These more complex encryption strategies employ keyed alphabet tables. With Quiptics, you can generate cryptograms “on the fly” for output in a variety of formats, or save the puzzles to files for further access or to distribute to others to solve on their computers. Quiptics runs on all currently supported versions of Windows, including Windows 10. Looking for low budget gambling experience? Check Casino is a site that offers their players the opportunity to deposit using your phone bill. These are predominantly minimum 1 deposit casino list at getcasinobonus.net and find sites with great bonuses. Promo codes for you every day! best new casino sites here. Looking for low budged gambling experience? Check . List atgetcasinobonus.net and find sites with great bonuses. Promo codes for you every day! How Slot Machines Favor the Casinos Over the Players. 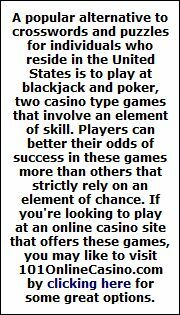 Tips to Help You Win More in Online Roulette. Find the best Casino Bonuses at Casino Gorilla! Slots-Online-Canada.com. This online resource combines a lot of useful information and a large number of exciting online slots. Visit Mr. Smith Casino and try your luck at live roulette. If you like interesting games you can play them at the biggest Swedish casino site CasinoTopp! HookupGeek--adult and web cam sites rating. Check Online Casino HEX to find the best online casino available in New Zealand with a wide range of casino games and high bonuses. Find the biggest jackpot games in Germany at Jackpot-Spiele.com. All about binary options trading. NZ casinos are well-known for providing quality gameplay and generous bonuses to gamblers. 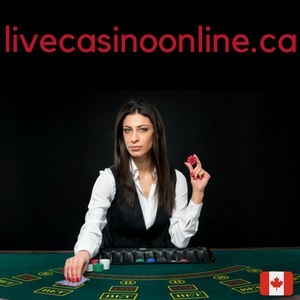 With online gambling being legal in the country, there are absolutely no risks for you to play your favorite casino games online. Discover everything about online gambling in NZ casinos along with the rating of top gaming houses available on the market today. Looking for a perfect casino match to play your favorite casino games for real cash? Check out the list of safe and trusted casinos to make first deposit at Online Casino HEX and play in best online casinos for real money! and big first deposit match. Join now! bonus when you sign up. 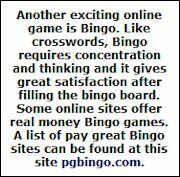 Tons of online bingo reviews are waiting for you at BingoHollywood. In addition, huge cash jackpots, promotions and many more. Find over 400 no deposit slots at mobile slot sites. Experienced gamblers and even beginners from Canada play games at online Casino Valley with the great number of games free. Pay by phone casino is the most convenient choice for mobile players. Tired of crosswords and other puzzle games? Discover finnish casinos! ParhaatUudetkasinot.com is a comprehensive guide to top casino operators. Quality sites offer English speaking support and most popular payment methods! Spice up your casino game, claim your deposit bonus and play best casino games! Reliable casinos will offer you match deposit between 100% and 200%. Find out which site prepared most generous promotions! Crossdown, this website, and Crossdown software products are copyright © 2016 by Sam Bellotto Jr. All rights reserved. Published and manufactured in the United States of America. Any reproduction of content by mechanical or electronic means without permission is strictly prohibited. All other copyrights, trademarks, service marks, and logos are the respective property of their holders. Please send all email to info at crossdown dot com. Response within two days.